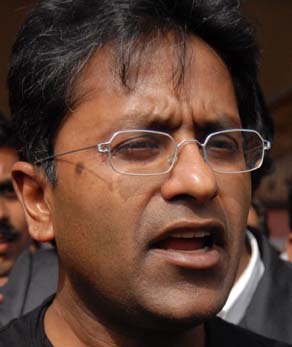 24 Apr : Pushed to the wall but still defiant, an embattled IPL commissioner Lalit Modi on Saturday refused to resign from his post and dared the BCCI to sack him in Monday’s Governing Council meeting. While the BCCI top brass went into a marathon huddle to chalk out the strategy to remove him from the post, Modi showed no signs of backing down and made his intentions clear through a series of tweets. “People pressurising me to resign – I can tell you (it) will not happen. Let them remove me then,” he wrote. “What we have done has been there for all of you to see for the past four years. No one can take that away,” he said. “Wait for the IPL to finish, I will reveal the men who have tried to bring disrepute to the game and how we stopped them from doing it,” roared Modi. “I am not the type to quit. Have faith. Did not create this to just walk away because xyz says what they feel like,” Modi declared. “What we have done has been there for all of you to see for the past four years. No one can take that away,” he added on a social networking site. “Media is putting stories without verification goes to show how media can misuse there power. Don’t get influenced by all these baseless stories,” he wrote. “Truth will prevail soon. Trial by media and no chance to present the facts is like the wild west. Wait and the facts will be delivered,” he said. Royal Challengers Bangalore’s Vijay Mallya said that despite media bashing it was heart warming to witness applause by owners/ players for Lalit Modi at the awards for the fine job he has done. Bollywood actress Shilpa Shetty of Rajasthan Royals said she supported full and fair investigations. “Full and fair investigation of IPL will compel loud mouths to shut up by realizing the true value of sixth largest sporting event in world”, Shilpa added. Under-fire from all quarters in the wake of Lalit Modi’s alleged financial irregularities in the running of the Indian Premier League, the Cricket Board is planning to form a small sub-committee to run the Twenty20 league in future. “The idea is to carve out a smaller committee out of the present IPL Governing Council and include three or four persons to run the show instead of making it a one-man show like it was till present,” the sources said. The names mentioned in the BCCI corridors are those of Arun Jaitley, Niranjan Shah, Ravi Shastri and Mansur Ali Khan Pataudi. All of them are members of IPL Governing Council headed by Modi whose days seem to be numbered. There are clear indications that Modi may step down after tomorrow’s IPL final between Mumbai Indians and Chennai Super Kings.